One beautiful day, mama hedgehog decides to take a walk. While she is out walking, a storm rolls in and she runs into an old pot for shelter. The pot is actually a gold pot at the end of the rainbow and mama hedgehog gets a colorful surprise! I would use this book with younger students to teach them colors. 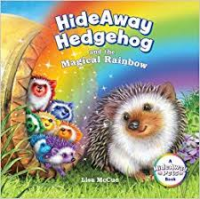 This book describes every color of the rainbow and it also has a hideaway puppet to go with it for interaction.